« Valentine’s Day special promotion! From us to you with Love! Gene Therapy Serum Cellular Repair #1 with FGF1 (Acidic Fibroblast growth factor) and non-crossed linked Hyaluronic Acid helps to restore damaged or aging skin, repair broken capillaries, improves skin texture, and boosts natural collagen and elastin production. Suitable for all skin types, all ages, all genders. Free full size of “Alpha and Omega” Gene Therapy Eye cream with every purchase of your favorite E’shee products of $489.00 or more. “Alpha and Omega” Gene Therapy Eye cream is highly concentrated cocktail of precious active ingredients, including patented aFGF, Far-infrared powder and Botox-like peptides targets wrinkles, sagging skin, dark circles and puffiness (bags) under the eyes. It helps to refine the texture of eyelids, crow’s feet, reduce a dark circles around eyes and fine lines around the mouth. 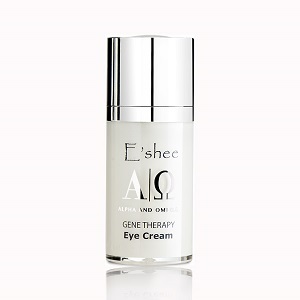 Please read more about this product at: http://www.esheeesthetic.com/alpha-and-omega-gene-therapy-eye-cream.html . No special arrangements are necessary. Just order you favorite E’shee products for $349.00 or $489.00 or more, and we will include this gift in your shipment. If you place an order for 489.00 or more, but you still want to receive “Gene Therapy Serum Cellular Repair #1” and not the eye cream, place your order, email us with your name, order number and request to receive the serum. This offer is valid November10th, 2017; until December 25th, 2017, 11:59 pm EST or while supplies last.